Beginning mid-October and continuing through mid-January, the North Carolina Museum of Art will host two rare and exciting exhibitions guaranteed to stimulate and inspire the mind. First, the astonishing works of Dutch artist M.C. Escher debut on Oct. 17, followed by the Oct. 31 opening for Leonardo da Vinci’s original “Codex Leicester,” a 500-year old notebook that showcases the breadth of da Vinci’s curiosity and the depth of his genius. Who has not had their mind blown by the perspective-bending alternative realities of M.C. Escher? The Worlds of M.C. Escher: Nature, Science and Imagination is comprised of more than 130 woodcuts, lithographs, wood engravings and mezzotints, as well as numerous drawings, watercolors, wood blocks and lithographic stones never before exhibited. The installation covers the artist’s entire career, highlighting his explorations of nature, mathematics and science. Escher’s best-known prints will be on view, as well as his lesser-known portraits and Italian landscapes, in the most comprehensive Escher exhibition ever presented in the United States. Next, get a first-hand look at the musings of one of the most prolific minds in human history. Leonardo da Vinci’s Codex Leicester and the Creative Mind features the Italian master’s Codex Leicester, an original 72-page manuscript that dates back more than five centuries. Named after the Earl of Leicester, who purchased the work in 1717, the Codex features drawings, rough sketches and notes written in the artist’s famed “mirror writing.” Examining the natural world, light, physics, astronomy and other subjects, this remarkable piece of Renaissance history illuminates the vast intellect that helped lead the world into a new, enlightened age. The Codex, on loan from current owner Bill Gates, is the only da Vinci manuscript in North America. 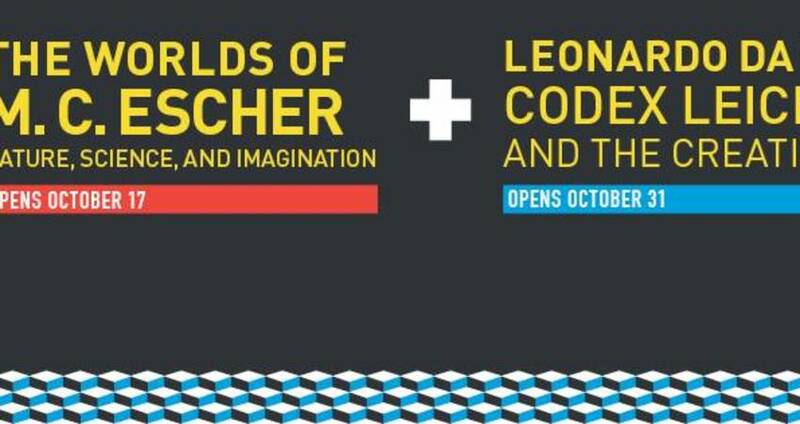 These events are ticketed together, so anyone who visits the Escher exhibit before the Codex Leicester opens will receive a return voucher. Check out the North Carolina Museum of Art website to buy tickets. In addition, there is a guided, one-hour Codex Leicester tour on Nov. 6 that is free with a paid ticket. There is also a Gallery Talks event, “Perspectives on Paper,” on Nov. 14 with experts in mathematics, sciences and the arts discussing both da Vinci and Escher. On Nov. 22, creativity guru Michael Gelb, author of How to Think Like Leonardo da Vinci, will present his aptly titled lecture, “You and the Creative Mind of Leonardo da Vinci,” followed by a book signing. For those who want to get hands-on, the Studio Samplers series in Nov. and Dec. offers participatory creative workshops related to the Escher and da Vinci exhibits. Don’t forget, the North Carolina Museum of Art offers terrific dining options and an outstanding gift shop, so you can always share the experience with family and friends!